IMPORTANT: PLEASE ATTEND AND GIVE YOUR SUPPORT!!! This stretch of 123 Ave. is part of a designated and important east-west bike route (123 route) and as such needs to be safe for all ages and abilities. It will connect to the new protected bi-directional cycle track on 203rd Street. There have been numerous complaints of speeding cars, which not only endanger cyclists and pedestrians, but also make the street less pleasant to live on. So something needs to be done. Over a year ago, the City held an Open House to get input from citizens about the planned traffic calming, consisting of traffic circles and curb bulges. This solution would have made the street more dangerous for cycling however, and there was significant feedback from the cycling community in support of the second option on display at the open house, namely, protected bike lanes, which is what the City is now considering. So that's why the City is now putting on this Information Session. 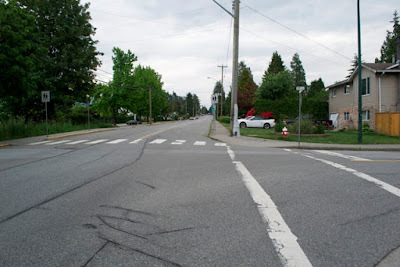 Note that there has been some negative feedback from residents along 203rd Street as well as drivers with regard to the bi-directional cycle track between Dewdney and Golden Ears Way, and residents are now concerned about what 123 Ave. is going to look like. A definite positive for 123 Ave. is that the bike lanes there are going to be uni-directional, on both sides of the road, which means drivers won't have the challenge of having to deal with cyclists coming from both directions when crossing the bike lanes. Therefore there will also be less need for copious amounts of that in-your-face bright green paint. All along 123 Ave. are single family homes with sizable driveways, which should satisfy residential parking needs for a good part, with the exception of some additional need for visitor parking. There is also curb parking available on a number of side streets. Curb parking close to Laityview School has up till now been heavily used at pick-up and drop-off times. Extra parking will be created as part of this project at Volker Park to accommodate parking for the school. As the school is French immersion, more students than average do not live in the catchment area and may need to be dropped off and picked up by car. Residents understandably do not like to lose part of Volker Park. Some feel that the desire to provide convenient car parking for all - even for short periods of time on school days only - should trump the need to provide safe cycling infrastructure for all ages and abilities 24/7 (which will not only allow more kids to get themselves to school on their own power, but also will make it possible for other residents to use the bike for some of their transportation needs). Please help HUB Cycling to make cycling better and safer for all ages and abilities in Maple Ridge by attending this Information Session and providing your input. We would love to receive a copy as well. 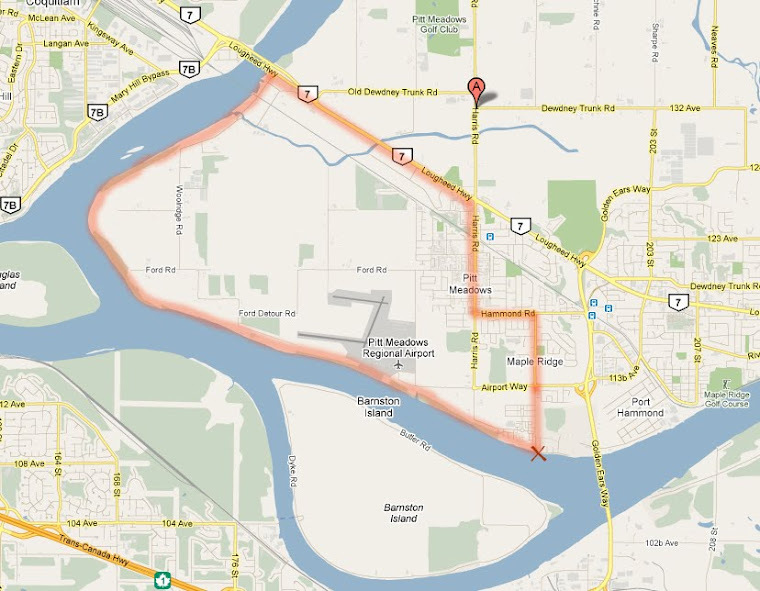 You can send it to: mapleridge-pittmeadows@bikehub.ca. Make sure to thank both Mayor and Council as well as Engineering for their commitment to make cycling better for all, and for the facilities on 203rd Street. Of course besides safety there are many more arguments you can use to support these bike lanes. E.g. improved health outcomes, for kids it means improved learning, behaviour and development thanks to active transportation, reduced greenhouse gas emissions, improved livability, a more equitable transportation system that works for all, reduced need for parking, etc. Thank you for your help! We can not do this without you! First off I am pro bike lanes. But this proposed plan down this street will hinder the 700 kids that attend the school as well as the streets surrounding the area as being a french immersion school with no bus service parking is already limited. I ask that you all take a moment to bike down in September to see the chaos that is 123rd street at 8:30am and 2:20pm. This is a HUGE factor in the planing for the street and making it safe for all abilities (as we do have children and parents/guardians with physical disabilities attending and picking up) This is more then just bike lanes its about the safety of all who use this street. Taking away a portion of the park to make parking is also taking away from our future (our childrens) learning as the school uses the adjacent park daily for learning. Please look at all sides of this proposed project and lets try to find a solution that works for EVERYONE. A debt of gratitude is in order for the post and incredible tips..even I likewise feel that diligent work is the most critical part of getting achievement.. This Is very informative . I am so glad to read this article.I have read many article but this is unique. If you need unique article like this about Vacuum Cleaner Click on it.